Emergency Medicine at Peyton Manning Children’s Hospital (PMCH) has been nationally recognized for overall patient experience, strong outcomes, and shorter wait times. This PEDS ER is only one of two ERs in Indiana dedicated to pediatric emergencies for children newborn to age 18. The Hilbert Pediatric Emergency Department has 17 private family-centered rooms. Bedside triage expedites care. Each child and family will have an ER room that is kid-friendly with find-and-seek murals, TV and video games. The rooms are equipped with child-size medical equipment for fast delivery of comprehensive emergency care. 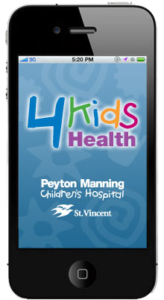 When specialty care is needed, the Pediatric ER team has direct access to more than 40 different pediatric specialists at Peyton Manning Children’s Hospital at St. Vincent. We are well prepared to care for children with acute, chronic and complex illnesses. The attending physician is always the PEDS/ER physician not a resident or intern. Throughout Indiana, the PMCH ER physicians are connected with the St.Vincent ONE Call system so your primary care physicians can access their expertise and all PMCH specialists. The Pediatric Radiology department is located in the ED. Dedicated Child Life specialists help distract and comfort your child as important testing procedures are done. In-House SART nurse and Social Workers are part of the ED team. Pediatric Sedation Services help those children who are having immense anxiety and are very fidgety during testing. SVEP is a leader in Emergency Department quality care and strives to provide the highest level of quality care to all of our patients. The physicians and providers receive regular education on evidence-based measures and participate in quality improvement activities to provide the best care to our patients.